Last time I talked about the process of deciding if a reaction goes through SN1, SN2, E1, or E2 as asking a series of questions. I call it The Quick N’ Dirty Guide To SN1/SN2/E1/E2. This is the second instalment. Once we’ve looked at a reaction and recognized that it has the potential for proceeding through SN1/SN2/E1/E2 – that is, is it an alkyl halide, alkyl sulfonate (abbreviated as OTs or OMs) or alcohol – and asked whether the carbon attached to the leaving group is primary, secondary, or tertiary, we next can look at the reagent for the reaction. In substitution reactions, a nucleophile forms a new bond to carbon, and a bond between the carbon and the leaving group is broken. In elimination reactions, a base forms a new bond with a proton from the carbon, the C-H bond breaks, a C-C π bond forms, and a bond between carbon and leaving group is broken. There’s a lot of confusion from students on this point. “How do I know what’s a nucleophile and what’s a base?”. Whether something is a nucleophile or a base depends on the type of bond it is forming in the reaction. Take a species like NaOH. It’s both a strong base and a good nucleophile. When it’s forming a bond to hydrogen (in an elimination reaction, for instance), we say it’s acting as a base. Similarly, when it’s forming a bond to carbon (as in a substitution reaction) we say it’s acting as a nucleophile. In other words, it’s a relationship. For instance, when I’m interacting with my wife, I’m interacting with her as a husband. When I’m talking to my mom, I’m interacting with her as a son. I’m the same person, but depending on whom I’m interacting with, our relationship has different names. Charged bases/nucleophiles will tend to perform SN2/E2 reactions. Reactions where neutral bases/nucleophiles are involved tend to go through carbocations (i.e. they tend to be SN1/E1). Again: Quick N’ Dirty is an 80/20 set of principles. There are exceptions!!! But this framework will help us in most situations. Let’s talk about charged nucleophiles first. It’s important to be able to recognize charged nucleophiles. The charges are often not written in, but “implied”. For example, NaOEt (sodium ethoxide) actually has an ionic bond between Na(+) and (-)OEt, even though the charges themselves aren’t written in (us chemists are lazy that way). So if you see Na, K, or Li, for instance, you’re looking at a charged nucleophile/base. Whether it’s K, Na, or Li doesn’t matter for our purposes – these are just spectator ions. In both the SN2 and E2 pathways the reaction is “concerted” – that is, the nucleophile/base forms a bond as the C-LG bond is broken. Since there is significant bond-breaking occurring in the transition state, the energy barrier for this step is higher than in the (second) step of the E1 or SN1; we’re going to require a stronger nucleophile/base to perform these reactions. Recall that the conjugate base is always a stronger nucleophile. Negatively charged species have a higher electron density and are more reactive than their neutral counterparts. If you see a charged nucleophile/base, you can rule out carbocation formation (i.e. rule out SN1/E1). In other words, the reaction will be SN2/E2. We can break things down even more, depending on how strong a base the charged species is; go to the section at the bottom of this post for some examples where we can use base strength to rule out E2. Neutral bases/nucleophiles tend to be weaker than negatively charged bases/nucleophiles. In order for them to participate in substitution or elimination reactions, generally the leaving group must depart first, giving a carbocation. Quick N’ Dirty Rule #4: If you don’t see a charged species present, you’re likely looking at a reaction that will go through a carbocation (i.e. an SN1 or E1). One special case worth noting is if you see a strong acid such as H2SO4 or HCl with an alcohol as a substrate. Unless you’re looking at a primary alcohol (where carbocations are very unstable) the reactions in these cases will almost always proceed through carbocations. It’s not uncommon to see a neutral nucleophile in the presence of a charged one (see example 2, below). In that case it’s likely acting as the solvent. We’ll talk about solvents next. 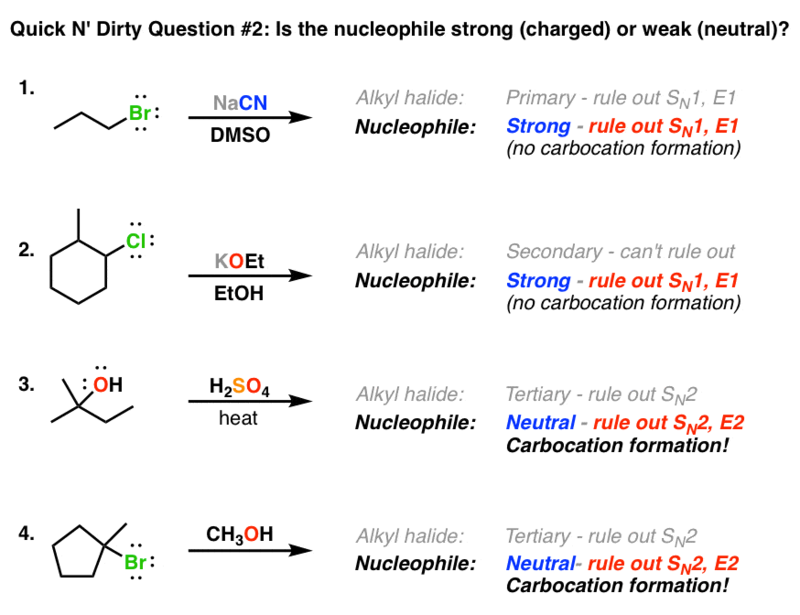 Here’s a chart where we evaluate this second question for deciding if a reaction is SN1, SN2, E1, or E2 (below). What’s the biggest weakness of the Quick N’ Dirty approach? It’s an oversimplification. To conclude that a reaction “proceeds SN2” or “proceeds E2” might give the impression that it gives 100% SN2 or 100% E2, and that is surely not the case! Often, these reactions compete with each other, and can therefore give mixtures products. When I say “SN2” , for instance, I mean mostly SN2. There are likely other products in there. The key lesson here is to understand the concepts – “what conditions favor each reaction?” and then to be able to apply the rules you know about each reaction to draw the proper product. Some charged nucleophiles are actually poor bases. Here’s a good rule of thumb: if the conjugate acid of the base/nucleophile is less than 12, an E2 reaction will be extremely unlikely. So if you see a nucleophile like NaCl, NaBr, KCN, and so on, it will favor SN2 over E2. (This is a more rigorous way of saying that weak bases don’t perform E2 reactions). In contrast, the bulky base below (tert-butoxide ion) is a strong base but a poor nucleophile due to its great steric hindrance, so an E2 reaction is much more likely than SN2. Finally, there are also neutral species which are good nucleophiles (and poor bases) such as PPh3, below. Here, the good nucleophile (cyanide ion), if present in large excess, can overpower the weak nucleophile (solvent). Of course the ultimate arbiter of such statements are actual experiments. If the alkyl halides are primary, they’ll react at SN2 with moderate base, like -OH, -CN, or CH3O-. I had a tricky question on a test yesterday. It wanted to know if methylchloride reacting with H2O would be SN1 or SN2. The professor put it would be SN1, but wouldn’t the methylhalide force it to be SN2? I think this problem could do both or not react at all. What are your opinions? I apparently got it wrong because I picked SN2 since those were the only two options. Tammy, I agree, it’s not a fair question. Methyl halide would not react using SN1 because it’s impossible for a methyl carbocation to form. It would also not react using SN2 because H20 is polar protic. Talk to your professor about it! You got it wrong because you picked SN2 for methyl chloride???? Whoever is teaching you SN1 happens with methyl cations doesn’t know what they’re doing. Hi, what if you have a strong nucleophile and a strong base like OH- and you are reacting with a tertiary haloalkane. Does not Sn1 and E2 pathway is both possible? How would you then choose whether Sn1 work? Assume there is no solvent. Thanks! Equilibrium for self ionization of alcohol ROH to RO- and H+ is disfavored by 10 to the 16th power. but when we take reactions and see like weak base and weak acid,there is a formation of salt always.My point is if it starts the reaction then equilibrium shifts and whole of it would react! in the exception column PPh3 undergoes SN2 but P is stabilized by 3 Ph and therefore will undergo Sn1 right?or is e- density on P high as it is not electronegative(unlike F) even after resonance stabilization? regarding NR3,it is nucleophilic & is comparable with OH- due to the reason its lower electronegativity and inductive effect? In Q2, part 3, Why is H2SO4 a neutral nucleophile? It seems like it would donate H+, and then become charged. HSO4- which is inert as a base (since it’s the conjugate base of a strong acid), but due to its negative charge could be a decent nucleophile. The negative charge on oxygen in HSO4- is very resonance stabilized and simply does not act as a competent nucleophile in the vast majority of situations, so it’s easier to treat it as a non-nucleophile. So then from where does the formation of hydrogen sulphonate come into the picture? If you use H2SO4 as an acid with an alcohol, HSO4- is the counterion. It doesn’t typically react with the substrate. O-H bond. What makes CH3OH more acidic.? thanks for this extremely helpful website though! CH3CH2CH3CH3OCH3 + N3- ——–> ? with a solvent of acetone. Is this an SN1, SN2, E1, or E2 reaction? I think it might be an elimination 2 reaction but I am confused because in this case we are not removing a halite and N3- isn’t anything I have listed for a base/nucleophile in my notes. Hey.Great site-I can understand and enjoy organic chem better now. A Question.How can triphenyl phosphine be a good nucleophile ?? It has three phenyl rings then it should be sterically hindered. First of all the PPh3 has a trigonal pyramidal geometry, so a lone pair is pointing in the opposite direction from the phenyl groups. Secondly, the C-P bonds are fairly long which decreases the steric hindrance somewhat. PPh3 is a good enough nucleophile to do SN2 reactions of primary and secondary alkyl halides. Less than 12 what? I’m confused here! This tip sound very handy but I have no idea why figure 12 is supposed to stand for! I don’t know if you have figured it out already, but I still just wanted to quickly respond… the figure ’12’ as given in the situation you mentioned is the numerical value for the pKa of a given compound. Basically, it tells you via a numerical measure the extent of the acidity and/or basicity of a chemical compound you are looking at. So, as James says, “if the conjugate acid of the base/nucleophile is less than 12,” then the base is probably too acidic and not enough basic to act as an eliminating agent for the E2 reaction pathway to occur for that set of reactants and reagents. You should to able to find good reference tables with pKa values calculated and already listed for organic compounds and the like, either online or in a major chemistry textbook (especially o-chem textbooks), if you need to look up values! Hope this helps! You should honestly ALL be familiar with the pKa’s of the common functional groups, as well as the common acids. If any of you are planning to go beyond Organic I & II, you will definitely be REQUIRED to memorize these. They WILL show up on every exam you take, and you will need to know them so you’ll be able to work through a problem in a timely manner. After all, a lot of people perform poorly due to time constraints, especially the ones who DON’T memorize important pieces of information like pKa values and as a results, have to consult a textbook. If you start now, I guarantee they’ll be helpful and you won’t forget them. Dilek, when we talk about CH3COOH It’s ionize form Is CH3COO- And H , inwhich CH3COO- is a conjugated base and a good nucleophile bcoz it is higly negative and can donate electrones more efficiently..
Why comments are not seen?? What happens if you have a starting product like Cl-CH3-CH3-CH3-CH3-OH and a nucleophile of OH- in DMF solvent? I know it doesn’t work, but why? James how did you decide that the OH- will deprotonate the Cl-R-OH? Does having the Cl makes the molecule more acidic than say an alcohol of the same length would be (which in turn makes it more likely to swap its proton with the hydroxide)? If so doesn’t the length of the molecule significantly reduce the Cl’s effectiveness as an electron withdrawing group? Generally acid-base reactions are much faster than substitution/elimination due to a rule we call “the rule of least motion” which means that proton transfers on atoms like O don’t involve hybridization changes or any other significant molecular reorganization, while sub and elim reactions on carbon do. “Acid base reactions are fast”. if we had say 2-chloro-3-methylbutane and then reacted it with a weak nucleophile/base as in ethanol but we place it in a polar aprotic solvent such as acetone, would this mean we could any of the reactions, SN2, SN1, E1 or an E2 reaction because the polar aprotic solution favours SN2 and E2 reactions while because we have a weak base/nucleophile it should favour a SN1/E1 reaction? or is there something i’m missing, I initially thought because we have a weak base as in ethanol and a non bulky secondary alkyl halide within a polar aprotic solvent that would undergo a SN2 reaction, but then i realised that the ethanol base is not charged, should I assume it is charged by separating the ethyl R group and the OH, making [OH]-? Ethanol by itself is unlikely to be basic enough to promote an E2 reaction; I would expect that an SN2 reaction with ethanol as the nucleophile and acetone as the solvent. Quick question with regards to notation…when a reaction is written with one compound on the top of the arrow and one at the bottom, are those to be understood as the nucleophile (reagant) and solvent. Are they always written in this order? I realize this might be a very basic question, it’s been years since gen chem. Generally speaking, yes. And yes, they are typically always written in this manner. A lot of the time, you will also see reaction conditions (like temperature and rxn time) written underneath the arrow as well. But isnt the conjugate base of a weak acid a strong base?HCN is a weak acid and hence its conjugate base CN- must be a strong base. But it has been stated that CN- is a weak base and hence would not favour E2 over Sn2! What if the nucleophile/base is small but is a strong base…E2 would predomimate right?As the absraction of proton becomes easier? CN- is a strong nucleophile but a weak base. It would favor substitution over elimination. CN- is a weak base??! !how is that possible? P(Ph)3 is a weak base because the lone pair on Phospohorous is involved in resonance with the three phenyl groups and hence the lone pair is less available for donation .This would decrease its ability to act as a base (Lewis base concept).Firstly is this correct? And since P(Ph)3 is a weak base it favours Sn2 over E2 even though its bulky.Right? But, the C-LG bond has to break even in the cases of SN1/E1 reactions… So how do the above lines explain anything? You can think it this way: the carbon in an alkyl halide before SN1 is sp3 hybridised. Thus, it has tetrahedral Geometry. But after formation of carbocation, the carbon is sp2 hybridised and has planar geometry, hence , greater stability. Ah… yes. I see how this is confusing. I was referring to the *second* step of the E1 and SN1 reaction, *after* the carbocation has formed. I edited the text to reflect that. Thank you. If our nucleophile is (CH3)3CONa, it is E2, right? And the secondary reaction? SN1? Yes, should be E2. That goes for secondary and tertiary alkyl halides. Why wouldn’t a charged nucleophile attack a charged electrophile? Generally, the E1 and SN1 occur with solvent as nucleophile or with very weak neutral nucleophiles. Thus when a charged species is added, it tends to be promoting an SN2 or E2. Keep in mind these are rough guidelines. There are tons of exceptions – amines or phosphines as nucleophiles for example, or when a salt like KI is added to a tertiary alkyl halide such as t-butyl chloride. It’s more about how this subject is tested than anything else. Do rates have factors at play here as well? Are SN2/E2 generally faster than SN1/E1 (second order > first order)? I had a chem problem, so the original reaction is 1-bromopentane with NaOH which would undergo the SN2 reaction, however what experimental modifications can be done in order to form 1-pentene (E2 product). I already said a hindered base could be used like NaOC(CH3)3 however i need one more experimental modifcation, would heat work? Just by adding head to 1-bromopentane would that favour the E2 reaction rather than the SN2 reaction? Nice work. Just a quick question: In your example of ”Exception: Neutral Nucleophiles in SN2 and E2 Reactions” shouldn’t the triethylamine form the less substituted alkene. Here you show the most substituted alkene. The normal rule would be ”major product w/ bulky base: less substituted alkene formation (steric hindrance)” and I feel like NEt3 is pretty bulky. Can you explain? I have a hard time understanding this one. You raise a valid point. This would likely result in two products, but I’m not sure of the ratio. I don’t think that NEt3 is so bulky that it would completely prevent formation of the more substituted alkene however. It really depends on the substrate. The pKa of aniline is about 30. Triethylamine is not a strong enough base to deprotonate it. I did not get the meaning of this. Please Explain. This is a more precise way of saying that weak bases will not promote the E2 reaction. NaNH2 is a base. CH3I is an alkyl halide that reacts with alkoxides. Why is alcoholic KOH acts as base whereas aqueous KOH acts as nucleophile in E2 and SN2 reaction? It completely depends on the substrate. What’s the reactant? From all of the practice i have since so many months, I guess the ‘Quick n Dirty’ rule for deciding SN1/SN2/E1/E2 is mostly (>95%) applicable, but whether it will perform substitution or elimination is more of a gut feeling. If you have done enough practice, you would mostly guess it correctly, purely due to experience. Would NaBr be an acceptable substitute for NaCl? Is sodium ethoxide a nucleophile? how can we come to know that? It has a lone pair. Anything with a lone pair that can be donated (i.e. a Lewis Base) is potentially a nucleophile. When ethoxide attacks H, we say it’s acting as a “base” (specifically, a Bronsted base in this instance) which will result in elimination. When ethoxide attacks any atom other than H (like carbon) we say it’s acting as a “nucleophile”, which will result in substitution. If i use sodium ethoxide in ethanol,on 2-chlorobutane what sort of pathway should the reaction follow…E2 or SN2? I think it should be SN2 as the base is small and is a charged species so it can act as a nucleophile. Does it make a difference if i use sodium ethoxide in different solvents for this reaction? It’s a Williamson ether reaction.